Paring on the 26th of February at 8 p.m. at the Bogt Fen Gunee in Franeker. Frderik Bos was qualified with 6 pts. but has unfortunally to play with his team Winschoten the KNDB National Leage. 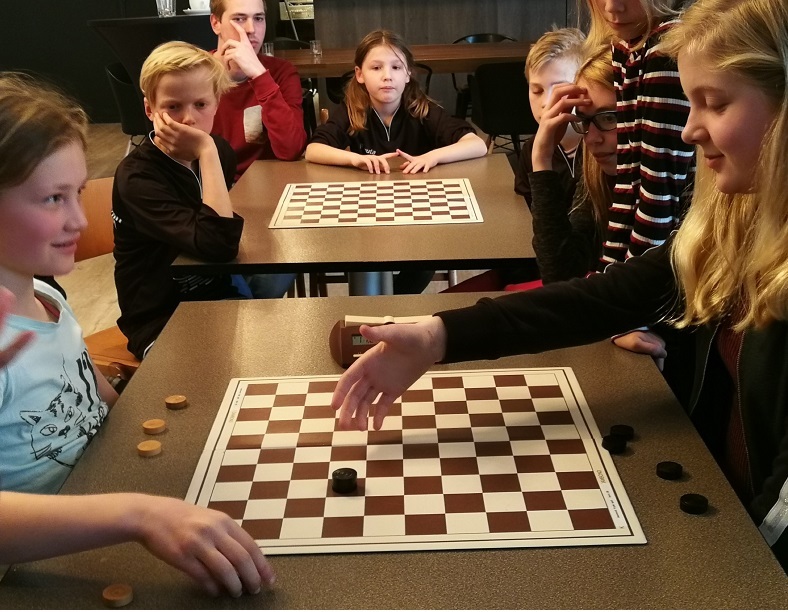 In Franeker the Fryslân Open Tournament started on Wednesday 27 February. This is a five-day tournament in Frisian Draughts. More than half of the participants are international draughts players, some of them regular guests for years. Nevertheless, until now the Frisian players still show a better mastery of this difficult game. The four players who did not lose any points all belong to the top of the Frisian draughtsp layers. Neverthelss the public was in for some surprises. The greatest of these was the loss of top player Foeke Tiemensma from Franeker against Petra Dušková from the Czech Republic. She conjured up a spectacular combination and Tiemensma, though playing in his own home town, could only resign.